The navigation buttons on the left will help you with lots of other terms and definitions. The canvas or cord which is attached to the cloth and warp beams and which is long enough to reach the shafts. The apron has a wooden bar or metal rod for attaching the warp threads. Beam at the back of the loom over which the warp passes after leaving the warp beam. Beam at the front of the loom over which the cloth passes before it winds onto the cloth beam. Beam in the front of the loom which rotates and holds the woven cloth. Beam above the cloth beam over which the cloth passes before it winds onto the cloth beam. It allows space for the weaver’s knees. Beam at the back of the loom which rotates and holds the warp. A warp beam divided into sections for warping very long warps. Other equipment is necessary to make sectional warps. Sticks which are placed onto the warp beam as the warp is wound on. Winding a prepared warp onto the warp beam. Swinging frame holding the removable reed, used to beat the weft in place. A shuttle which looks like a boat and is hollowed out to hold a bobbin or quill of weft thread. Spool for a boat shuttle, on which weft thread is wound. A tool for winding bobbins or spools either by hand or electric power. A device to hold a warp beam from turning, made of a metal cable or band which winds on a metal drum. A loom with a pulley system with horses or dowels to attach the shafts. When a shed is made, some shafts rise and some sink. A loom with jacks at the top of the loom with cords attaching them to the shafts and two sets of lamms. When a shed is made, some shafts rise and some sink. The narrow spaces in the reed, stated by the number of dents per inch or per 10 centimeters. 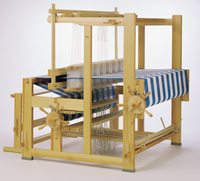 A two harness loom. The first harness usually has 4 – 10 shafts and the second creates a pattern by using a set of shafts or individually tied groups of threads. To read more on drawlooms. A warp end is one warp thread of the prepared warp. A protective board that is attached to the breast beam. For more information see protector. 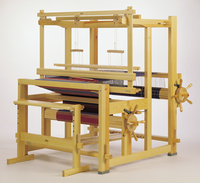 A shuttle used for weaving on wide looms which is supported by a shuttle race and moves across the loom by pulling a cord. Thread, wire, metal or Texsolv polyester loops held by the shaft sticks with eyes for threading warp ends. A loom with jacks below the shafts to push the shafts up, or on top of the loom and attached to pull the shafts up. When a shed is made, some shafts rise and the other shafts remain down by their own weight, as they are not tied to anything which would keep them down.